The real issue is that of Communist China’s military occupation of Tibet since 1950s. To resolve this problem, India has joined hands with the United States and has been consistently trying to provide a platform to the Tibetan exiles and help them to establish Freedom, Democracy, and Justice in Tibet. This military cooperation between the United States, India, and Tibet paved the way to a National Uprising Day in Tibet on March 10, 1959. This Movement to demand Freedom was crushed by the Chinese Communists and Tibet’s Head of State and the Spiritual Leader, His Holiness the 14th Dalai Lama was forced to leave Tibet and live in exile. Further, People’s Republic of China retaliated against India for helping the Tibetan Resistance Movement. China launched a massive military attack on India along its entire Himalayan frontier. There can never be border settlement between India and China without resolving the problem of military occupation of Tibet. Special Frontier Force – Freedom in Tibet: Chinese incursions in Ladakh are a manifestation of the disease called military occupation of Tibet. 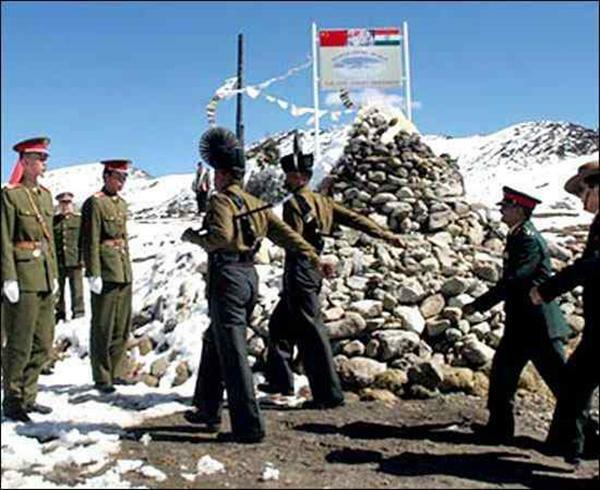 Special Frontier Force – Freedom in Tibet: The real issue between China and India is not that of demarcation of international boundary or recognition of a Line of Actual Control. This Himalayan frontier will remain undefined until Freedom, Democracy, and Justice are established in the occupied Land of Tibet. With China’s “peaceful rise” giving way to a more muscular approach, Beijing has broadened its “core interests” and exhibited a growing readiness to take risks. As if to highlight its new multi directional assertiveness, China’s occupation of a 19-km deep Indian border area close to the strategic Karakoram Pass has coincided with its escalating challenge to Japan’s decades-old control of the Senkaku Islands. China is aggressively conducting regular patrols to solidify its sovereignty claims in the South and East China seas and to furtively enlarge its footprint in the Himalayan borderlands. 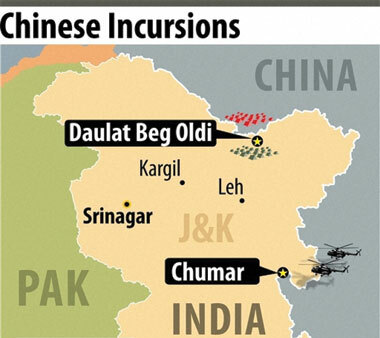 In this light, it will be a mistake to view the Chinese intrusion in Ladakh in isolation of the larger pattern of increasing Chinese assertiveness that began when Beijing revived its long-dormant claim to Arunachal Pradesh just before the 2006 India visit by its president, Hu Jintao. The resurrection of that claim, which was followed by its provoking territorial spats with several other neighbours, was the first pointer to China staking out a more domineering role in Asia. It was as if China had decided that its moment has finally arrived. Playing a game of chicken, China has been posing major new challenges to India, ratcheting up strategic pressure on multiple flanks, including stepping up cross-border military forays and shortening the length of the Sino-Indian border so as to question India’s territorial sovereignty in the eastern and western sectors. It has repeatedly attempted to breach the Himalayan border through incursions by taking advantage of the fact that the frontier is vast and forbidding and thus difficult to effectively patrol by Indian forces, who are located in many sections on the lower heights. When an incursion is discovered, Beijing’s refrain — as in the present episode — is that its troops are on “Chinese land”. Still, the intrusion into a highly strategic area shows India’s political and army leadership in poor light and exposes the country’s floundering China policy. Along with the subsequent violation of Indian airspace by Chinese helicopters in Ladakh, it brings out how China is seeking to alter the realities on the ground by exploiting India’s leadership deficit and political disarray, which have crimped military modernisation and undermined national security. The question the Indian army leadership must answer is how it was caught napping in a militarily critical area where, in the recent past, China repeatedly had made attempts to encroach on Indian land. Instead of regular Indian army troops patrolling the line of control, border police have been deployed. The Indo-Tibetan Border Police personnel, with their defensive training and mindset, are no match to the aggressive designs of the People’s Liberation Army and thus continue to be outwitted by them. Even in response to the incursion, the government has sent ITBP and Ladakh Scouts, not regular army troops, to pitch tents at a safe distance from the intruders’ camp. Worse yet, India remains focused on the process than on the substance of diplomacy, even as China steps up its belligerence. Process is important but only if it buys you time to build countervailing leverage. Unfortunately, a rudderless India has made little effort to craft such leverage. Rather, New Delhi is playing right into Chinese hands by merely flaunting the process of engagement and thereby aiding Beijing’s strategy to use this process as cover to further change the status quo on the ground. India should be under no illusion that diplomacy alone will persuade China to withdraw its soldiers. One way to force China’s hand would be for the Indian army to intrude and occupy a highly strategic area elsewhere across the line of control and use that gain as a trade-off. More fundamentally, India can maintain border peace only by leaving China in no doubt that it has the capability and political will to defend peace. If the Chinese see an opportunity to nibble at Indian land, they will seize it. It is for India to ensure that such opportunities do not arise. In other words, the Himalayan peace ball is very much in India’s court. 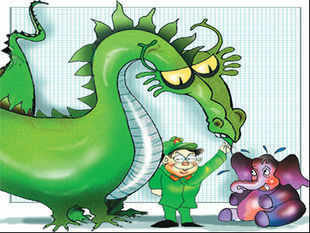 India must have a clear counter-strategy to tame Chinese aggressiveness. Tibet remains at the core of the Sino-Indian divide, with India’s growing strategic ties with the US rankling China. Even as old rifts persist, new issues are roiling the ties. Booming bilateral trade, including a widening trade surplus in China’s favour, has failed to subdue Chinese belligerence. Although in 1962 China set out, in the words of premier, Zhou Enlai, to “teach India a lesson”, it has frittered away the political gains it made by decisively defeating India on the battleground. Indeed, as military tensions rise and border incidents increase, the relationship risks coming full circle. To build countervailing leverage, India has little choice but to slowly reopen the central issue of Tibet — a card New Delhi wholly surrendered at the altar of diplomacy during the time Atal Bihari Vajpayee was prime minister. Of course, the process of surrendering the card began under Jawaharlal Nehru when India in 1954 recognised the “Tibet region of China” without any quid pro quo — not even Beijing’s acceptance of the then prevailing Indo-Tibetan border. Vajpayee’s recognition of full Chinese sovereignty over Tibet was based on Beijing’s acknowledgement that Tibet is an “autonomous region” in China. The fact that China has squashed Tibet’s autonomy creates an opening for India to take a more nuanced position. More broadly, China’s “string of pearls” strategy can be countered by forming a “string of rapiers” with like-minded Asian-Pacific countries. At the root of the growing tensions and insecurity in Asia is China’s ongoing strategy to subvert the status quo. Only mutually beneficial cooperation can shield Asian peace and economic renaissance, not muscle flexing and furtive moves.